When completed the Northeast Texas Trail will be the longest Hike/Bike and Equestrian Trail in Texas and the 4th longest in the U.S.A.
NETT Coalition is the product of the commitment and partnership among local and statewide trail advocates, and county, state and federal government agencies. 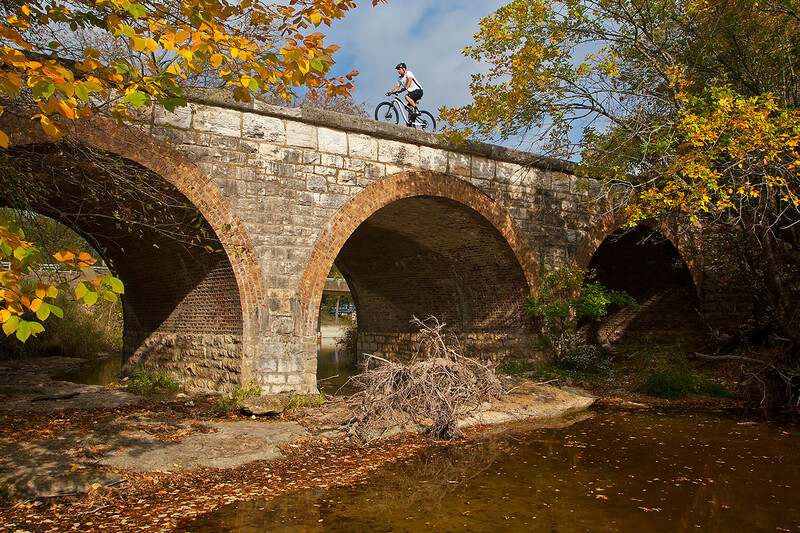 Over the course of a two-year effort, the NETT Coalition mission has been “re-cycling” an invaluable rail banked corridor into pedestrian, bicycle, and equestrian trails for moving people through the picturesque countryside of Northeast Texas. It traverses from Farmersville (East Dallas) through 19 rural towns and 7 counties to New Boston (West Texarkana) linking population centers, community facilities, work places, neighborhoods, schools, recreation areas, open space and cultural/historical areas. The NETT Coalition is committed to organize the public and policy-makers to create a comprehensive system of trails, parks and protected natural areas as a vital component in the region’s economy and quality of life. The infrastructure for the NETT was made possible by the creation of the 1983 Federal Law called the National Trail Acts and the Rail Banking process. Rail banking is when a railroad company voluntarily sells, donates, or leases unprofitable or unwanted rail lines and tracks to a qualified public or private entity (the Rail bank entity). Via this Law, land for construction of the NETT project is provided at no cost. In the late 1990’s, 2 railroads, the Union Pacific and the Chaparral decided to cease active service and publicized their railroad corridors availability for rail banking through the Surface Transportation Board of the United States Department of Transportation (STB). 3-private agencies Rails to Trails Conservancy (RTC) 1997, Greater Paris Development Foundation (GPDF) 1996, and Chaparral Rails to Trails Inc. (CRT) 1995 realizing that this will be an investment with a great rate of return that will richly enhance the quality of life in Texas applied for and became rail bank entities: RTC from New Boston to Clarksville, GPDF from Clarksville to Paris, Chaparral from Paris to Farmersville. The rail bank entity assumes financial responsibility for, and management of the railroad and trail right-of-way (ROW). Rail banking rules and regulations are set by the Interstate Commerce and the STB. The railroad has the right to re-establish rail service in the corridor ROW. The rail-banked corridor is not considered abandoned. The rail banked corridor, and any trail improvements are managed by the rail bank entity. The ROW does not revert to adjacent landowners. Thus a rail-banked corridor is not splintered and is kept intact for future railroad use. In 2001, the city of New Boston and the Chamber of Commerce acquired the 25.645 acres from the Union Pacific railroad. This acquisition included 1.2 mile of right of way within their city limits. On June 17, 2002, the City of Farmersville obtained a quit claim deed from Chaparral Rails-to-Trails Inc. from its rail-banked corridor within Farmersville city limits northward to the Colin County line. In 2010, The City of Farmersville annexed this corridor. On October 17, 2003, the County of Bowie obtained a quit claim deed from Rails-to-Trails Conservancy of its rail-banked corridor from New Boston west city limit westward to the Bowie County line. On October 23, 2006, The Cities of Clarksville, Annona, and Avery obtained quit claim deeds from Rails-To-Trails Conservancy for its rail banked corridor from the west Bowie County line to Clarksville’s west city limit. In 2007 the president of the Rail-To-Trails Conservancy contacted a GPDF steering committee member about their latest rail banking transactions with Clarksville, Annona, and Avery. During that conversation it was noted that a unique opportunity exists in Northeast Texas to construct a 130-miles of contiguously rail banked corridors. The GPDF representative contacted the Mayor of Clarksville and the President of CRT and a meeting of representatives of the rail banked entities was held in Clarksville to shape the “diamond in the rough” in our Northeast Texas region into a shining destination for active transportation participants. It was the Charter Steering Committee of the NETT. In Texas, a trail is defined as a linear park. This project was posed to Texas Parks and Wildlife Department for their constructing and maintaining a 130-mile linear State Park in Northeast Texas. They said that their current budget did not allow for new State parks. In 2009, the USDOT announced the Transportation Investment Generating Economic Recovery (TIGER) grant program. Our project qualified in the rural arena. The GPDF representative with the aid of the Charter Steering Committee coordinated the data input and wrote the grant application. The City of Paris agreed to be the sponsor. It was not funded. In 2010, TIGER II was announced. The Charter Steering Committee applied again. This time ARK/TEX Council of Government asked to be our sponsor and aided in obtaining trail towns and county support resolutions. Hayter Engineering of Paris again provided the project cost estimate-pro bono. The Executive Director of the Paris Economic Development Corporation prepared an in depth project cost benefit. It was not funded. Although neither got funded, the preparation of the TIGER applications provided the motivation that formed the ground work for solidifying the partnerships with the rail bank entities, the 19 rural trail towns, and 7 counties. Further, it brought to the forefront the reality of the recreational, tourism, economic development, health, and environmental benefits this trail completion would bring to Northeast Texas. Seek your consultation, participants’ responsibilities, project goals and objectives, and methodology for the efficient operation of the Northeast Texas Trail Alliance. Your expertise to develop the Trail’s strategic Marketing plan. We were awarded the grant in 2011 and 2-RTCA Community Planners were assigned to work with our Charter Steering Committee. During 2011, Trail supporters’ workshops and meetings were held at several trail towns to address a wide range of needs to have a successful 130-mile continuous trail. January 31, 2011, the Preliminary Steering Committee consisting of 15 key to date project advocates met in Paris to plan the 1st NPS workshop. April 12, 2011, the 1st NPS workshop was held at the Love Civic Center in Paris, Texas. The 84 attendees included State, County, and City officials, Chamber, Tourism, and Economic Development personnel, Bicycle and Running Club members, Industrial, Business and Civic leaders, and Public Administrators. June 28, 2011, the 2nd NPS workshop was presented in De Kalb. The 67 attendees included the same mix as the Paris meeting including many advocates for the eastern section of the project. The 3rd workshop was held in Farmersville on August 16th. In 2011, an extension RTCA program was applied for and awarded to finalize the Northeast Texas Trail (NETT) Coalition organization structure, By Laws, Board of Directors, Committee Structure, Goals and Objectives, Marketing Strategies, and funding sources. The Coalition’s #1 Goal is to have the entire 130-miles of the NETT cleared and graded where necessary in 2014. To date the original 2.5-mile Trail de Paris section of the NETT has been expanded 7 times to 11.5 miles. Five of the seven expansions have been the result of the Friends of the Trail partnering with Lamar County, City of Reno, City of Blossom and 3 times with the City of Paris to write the application and be awarded Texas Parks and Wildlife’s (TPWD) Texas Recreational Trails Fund grants. The Cities of Farmersville, Clarksville, and New Boston have also been successful in obtaining a TPWD grants to construct trails on their sections of the NETT corridor. May 18th Inaugural “Meet Me in the Middle” event uniting the 65-mile long east and west sections of our Trail. At 7am in the morning relay teams began at New Boston and Farmersville to meet in Paris. Four railroad spikes (that were powder coated gold) were driven into a Railroad tie by participants from the trail segments. The railroad tie was taken from the corridor and is likely over 100 years old. This symbolic gesture united the agencies from East, Middle and West! National TV coverage of a Trail Ride that was held on our Bowie County to Avery Trail section. and the more money they will spend!